The AIA International Region is now the 19th Region of the Institute. Regions are formed under authority of the Institute bylaws. Each Region is required to have at least 1.5% of the total Institute membership within its boundaries. In terms of expected membership – about 2,400 — the new AIA IR is roughly the same size as nine other regions of the Institute. It is considerably larger than at least three other Regions, and growing at a time when some others are shrinking. The IR is developing Bylaws and will be launching a website shortly as well as forwarding a survey to all members residing internationally to ascertain what areas members would like to focus on, including an AIA IR awards program, international conferences, publication opportunities, programs for Continuing Education and professional networking. The IR includes the five international Chapters (Hong Kong, Japan, Europe, Middle East and UK) and works with the IC/AG to foster the growth of new Chapters globally and the development of best practice globally. The IR aims to serve members in their own time zones so that AIA can be a truly 24-hour Institute that is relevant and available to all members of the profession and community. 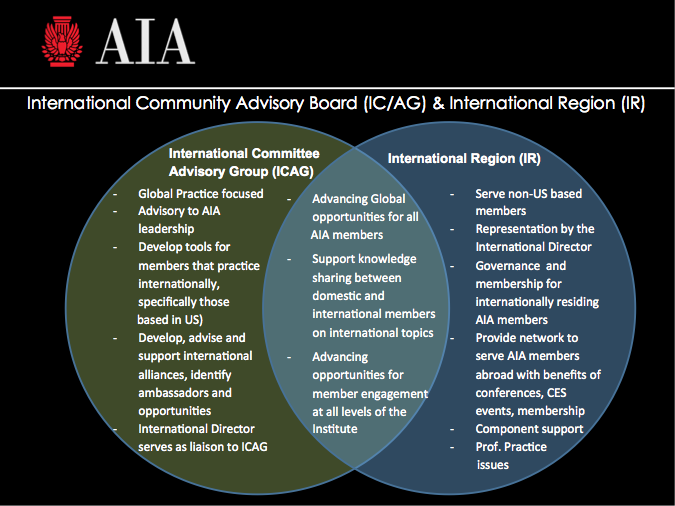 How does AIA Hong Kong fit within the International Region? 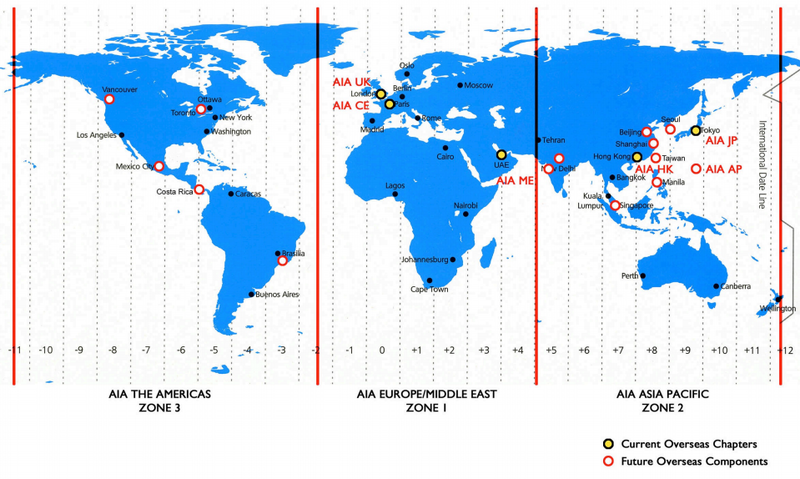 AIA Hong Kong is the largest international AIA Chapter, chartered in 1997. Plans are for AIA Hong Kong to work with all members and components in the IR with specific focus on the Asia Zone, working with AIA Japan in Tokyo, chartered in 2005, as well as an anticipated component in Shanghai and future components in Singapore, Seoul, Beijing, Taipei, and beyond. The aim is to build member benefits including international awards, international conferences, CES programs, greater visibility and opportunities to share important issues and best practice and much more. The IR will send forth a survey to ascertain what is most important to you, so please take a few minutes to respond when you receive it. And, if you are interested to help us in any of the developing areas or with any of the new initiatives, please contact us and get involved wherever you are. Thank you!